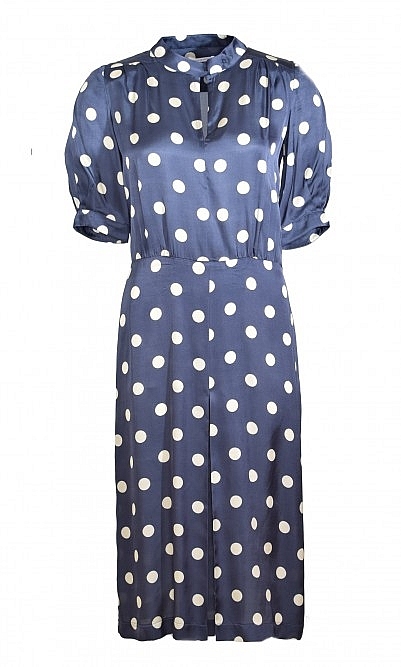 Silky navy polka dot dress given soft structure with inset shoulder pleating and single crisp box pleat on the skirt. Finished with pretty puffed sleeves and elasticated at the back of the waist to ensure a perfect fit. L110cm. Fabric and care: Viscose. Cold delicate wash. I got this dress in a Small and I can honestly say that it is the most beautiful dress. It hangs beautifully and the material feels lovely and silky and very fine. It certainly deserves 5 stars. Looking forward to wearing it in the Summer.